New York City Police have declared a “mass casualty incident” after a speeding car drove onto the sidewalk in Times Square, killing one and injuring at least a dozen people. The incident does not seem to be a terrorist attack, police said. One person was killed and 22 were injured, New York City Mayor Bill DeBlasio told reporters Thursday afternoon. He identified the victim as an 18-year-old woman. WCBS-TV has identified the suspect as a 26-year-old male resident of The Bronx. City officials confirmed that he had two previous drunk-driving convictions, in 2008 and 2015. The New York Post gives the suspect’s name as Richard Rojas. According to Mayor DeBlasio, Rojas is a US citizen and a US Navy veteran, with a criminal record. Law enforcement believes Rojas was high on K2, or synthetic marijuana, prior to the crash, WABC reported. A drug test came back positive, but blood tests are still ongoing to determine what substance he had in his system. An alcohol test came back negative. The car reportedly drove the wrong way up 7th Avenue, crossed onto the sidewalk and hit at least 13 people. 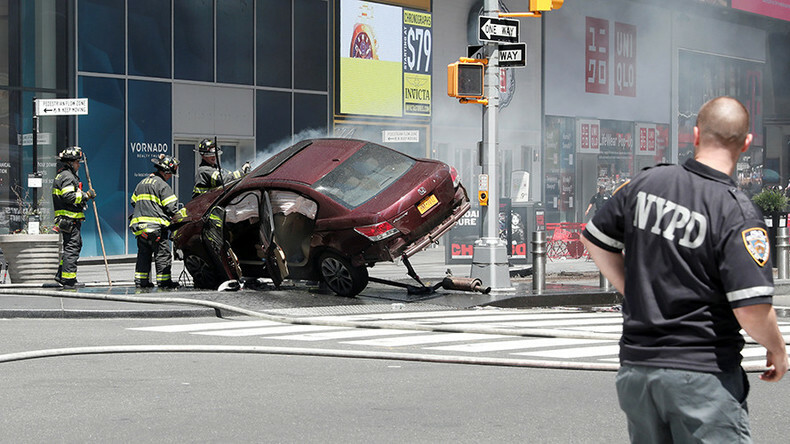 It eventually crashed into metal barriers at the corner of Broadway and 45th Street. Video and photos from the scene show dark red vehicle tilted to its side against a barrier, surrounded by firefighters. Another video shows a man being led away by NYPD officers. The crash took place as Rojas was fleeing from the police after a robbery, according to Fox News. The incident is not being treated as a terrorist attack at this time, according to NYPD. President Donald Trump has been “made aware” of the situation in Times Square and will continue to receive updates, said White House press secretary Sean Spicer. An injured pedestrian told Reuters that the driver’s actions appeared “intentional.” According to a witness, the vehicle drove against traffic and into the sidewalk, where it struck pedestrians. Police have cordoned off the intersection of 45th Street and Broadway, as they investigate the incident. New York Governor Andrew Cuomo (D) visited the site. Rojas was reportedly arrested last week after pointing a knife at a notary. Rojas claimed the notary stole his identity.